In February this year we introduced you to Brad Arthur’s sons, Jake and Matt. We were able to share a photo of Brad and the boys with the Auckland Nines trophy, and we told you a little bit about their achievements in rugby league. Recently Matt (Boods) Arthur just about scooped the pool at his end of year presentation night. 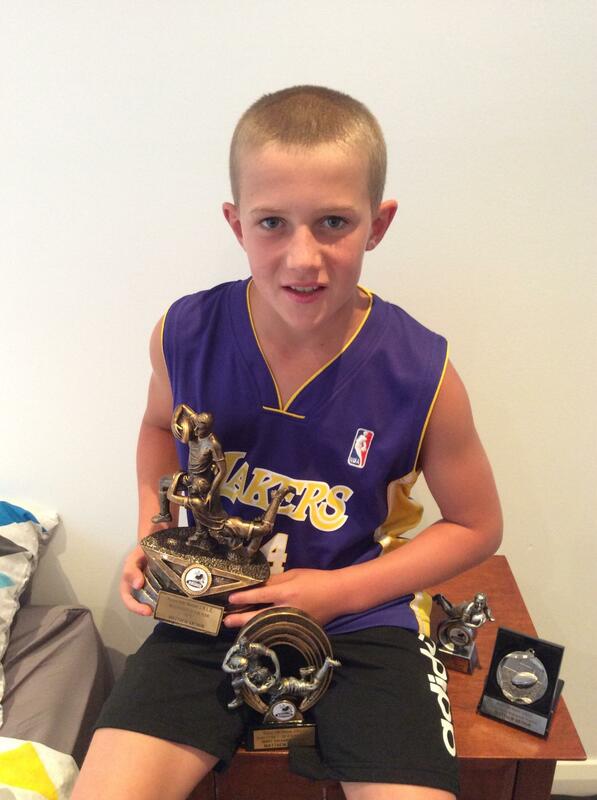 After a big season he picked up gongs for Best and Fairest, Mod Player of the Year and the Representative Player Award. Throw in captaincy of the successful PSSA Met West team and you have a year to remember. Boods is a dynamo out of dummy half, providing great direction and potent darts out of the ruck. He thrives in defence and regularly tops the tackle count. Matt Arthur with his trophy haul. Whilst we’re at it we should congratulate older brother Jake and his Rouse Hill Rhinos under 14 team mates for winning the 2016 PDJRL title in a rugged encounter against Canley Vale. TCT were at Pirtek Stadium to witness this enthralling match in which the Rhinos overcame their much bigger opponents. The Rouse Hill boys later went on to easily defeat the Penrith champions in the battle of the West. Jake is a skilful half who has excelled in this year’s Parramatta Eels Under 14 Development Squad. A family of Eels – Brad with his sons, Jake and Matthew. Matt and Jake are the fifth generation of the Arthur family to be involved with Parramatta in a connection which stretches back to 1947 when three generations of the family were at the very first match at Cumberland. May that connection continue for many generations more! Well done young Matt. I bet your dad is proud! Thanks Tristan. We’re honoured to be able to share this. Cheers Mitchy. I reckon BA might have to create a trophy room in the house for his kids. The young blokes have no doubt learnt plenty being around BA and the team. Great grounding. Maybe a poolroom, like The Castle…..? To Matt and Jake, just want to say congratulations. Hopefully you keep working hard and don the Eels jersey in the future. Your old man is the best thing to happen to the eels in while and I know you boys no doubt follow in his footsteps. Look forward to hearing about your successes in coming seasons. Just a one off reply guys thanking you for great article. I peruse your web site frequently and find it and its contributors intelligent informative and supportive as are its followers. Keep up the directions and values you have undertaken. A one off but cheers. Bring on 17!! Thank you for your kind words Ted! We can’t wait for the new season. Good on you Ted.Good to hear from you,you are probably I very proud man. Look forward to seeing you at the junior rep games this up coming season.The boys on here do a very good job. Nice to know Ted is there, and see’s the work put in. We value the work by the club Ted, and particularly the coaches. It is a good read about young family members. It’s great to hear from one of the arthur clan. This may be a one off post from you, but I, for one am delighted with it. Good luck to youngsters Matt and Jake. Oh, and good luck to that other young fellow, Brad, too!